As a Navratna company under the administrative control of the Ministry of Power, we have been rated 'Excellent' in terms of the MoUs signed with the Government for 22 consecutive years. We fund our business with market borrowings of various maturities, including bonds and term loans apart from foreign borrowings, on our own. Domestically, we hold the highest credit ratings from CRISIL, ICRA, IRRPL and CARE and internationally we are rated at par with the sovereign ratings. Under the discerning leadership of highly qualified and experienced professionals, which has effectively harnessed the individual talents of all our employees, we have maintained consistent profit margins and paid dividends each year since fiscal 1998. We have thus propelled ourselves to a net worth of over Rs 30,000 crore. Our humble beginnings spearheaded our strides into the corporate world and to this day our commitment towards nation-building constitutes our core value. As a natural corollary, we have been appointed as the nodal agency by the Government of India for implementation of Saubhagya (Pradhanmantri Sahaj Bijli Har Ghar Yojana) and DDUGJY (Deendayal Upadhyaya Gram Jyoti Yojana), the schemes which aim at providing 24x7 sustainable and affordable power to all households in the country. We have also been entrusted with the responsibility of being the coordinating agency for rolling out UDAY (Ujwal Discom Assurance Yojana) which seeks to operationally reform and financially turnaround the power distribution companies of the country. Our two subsidiaries RECPDCL (REC Power Distribution Company Limited) and RECTPCL (REC Transmission Project Company Limited) work in tandem with us to realise our shared mission by providing consultancy services in Distribution and Transmission sectors. We take due cognizance of the fact that we owe our stupendous success to our customers, the unflinching commitment of our employees and our countrywide presence through 28 offices which ensures easy accessibility. Having bolstered our share in the country's total power capacity, we are poised to help build a sound infrastructure to provide affordable, accessible and sustainable power. 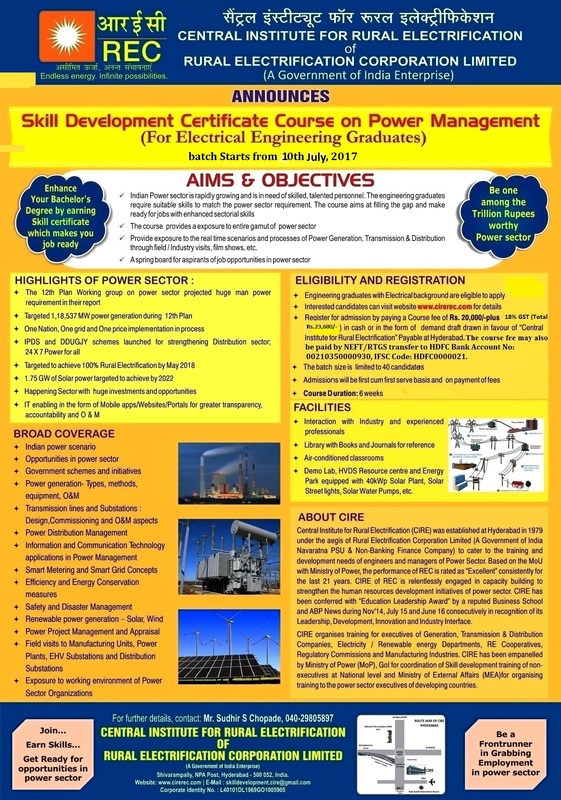 For Efficient implementation of projects, REC emphasizes on man power development so a training institute named RECIPMT is established at Hyderabad.